Kia’s compact Forte sedan retains its value-for-the-money status for 2017 while adding refined new styling, upgraded seat fabric, more features and a new, fuel-efficient engine. Starting manufacturer’s suggested retail price, including destination charge, for a base, four-door Forte with automatic transmission is $18,495. That’s only $55 more than the comparable 2016 Forte and includes heated outside mirrors; Bluetooth, hands-free phone connectivity; keyless remote entry; power windows; doors and outside mirrors; outside temperature display; and a trunk that rivals that of some mid-size sedans. Plus, the Forte, like all Kias, comes with the best new-car warranty package in the business, which includes powertrain coverage for 10 years or 100,000 miles, whichever comes first, along with a limited car warranty for five years/60,000 miles. That compares with five years/60,000 miles for powertrain coverage and three years/36,000 miles for basic car warranty coverage for a 2017 Toyota Corolla. The Forte is a recommended buy of Consumer Reports magazine, where predicted reliability for 2017 models is above average. The U.S. government gave the 2017 Forte sedan an overall five out of five stars in government crash test results. The five-seat Forte is also sold as a coupe and hatchback, but the sedan is the price leader with a starting retail price that’s at least $1,600 below the others. Amid today’s changing tastes where car buyers increasingly prefer SUVs to cars, the front-wheel drive Forte continues to shine. Through February, it was the only Kia car with U.S. sales above last year’s levels. BASE PRICE: $16,600 for LX manual; $17,600 for LX automatic; $19,300 for S; $21,300 for EX. TYPE: Front-engine, front-wheel-drive, five-passenger, compact sedan. ENGINE: 2-liter, double overhead cam, gasoline direct injection four cylinder with D-CVVT. OPTIONS: Premium Plus package (includes navigation system, forward collision warning system, ventilated front seats, power sunroof, rear cross-traffic alert, blind spot detection, lane keep assist) $4,490. The new exterior styling is a mostly subtle change, but it makes the Forte sedan more closely resemble Kia’s larger and pricier Optima sedan. The side profile of the Forte sedan is particularly attractive as it makes the car look like a coupe. The sleekly sloping rear roof doesn’t intrude too much onto rear-seat passengers, who still have 37.3 inches of headroom. The new 2-liter, double overhead cam, Atkinson cycle four-cylinder engine produces 147 horsepower and 132 foot-pounds of torque at 4,500 rpm, which is nearly the same power as the previous 1.8-liter four cylinder. But the engine works in a thrifty manner and with an updated six-speed automatic transmission. So fuel mileage is improved to a top federal government fuel economy rating of 29 miles per gallon in city driving and 38 mpg on highways for a 2017 Forte sedan with the automatic. With the Forte’s 13.2-gallon fuel tank, it now can travel for up to 422 miles on a single fill-up. 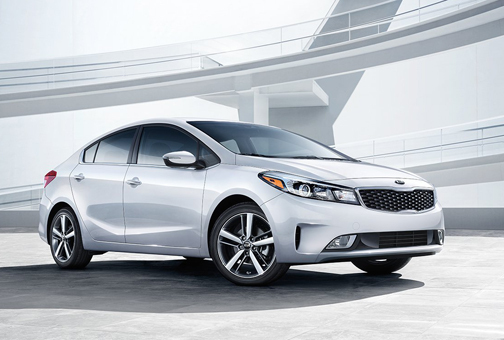 A manual transmission is still offered in the Forte sedan for the new base engine. An uplevel 2-liter, four-cylinder, direct injection engine without the Atkinson cycle that generates more horsepower and torque than the base engine is mated to the updated automatic transmission. This 164-horsepower engine was in the test, top-of-the-line Forte sedan EX and provided good power that could get the front wheels to screech as they worked to grab the pavement during some startups. Torque peaks at 151 foot-pounds at 4,000 rpm. The test Forte sedan EX had three drive modes – Normal, Eco and Sport – and averaged the federal government’s combined city/highway estimate of 28 mpg even though the car was driven in an occasionally aggressive manner and spent most of the time in Normal mode. The Forte’s ride and management of road bumps was nicer than expected for a lower-priced car, and passengers rode comfortably. There was road and a bit of wind noise, and the engine was readily heard during accelerations. Brakes worked strongly, and the electric power steering provided a decent road feel and response. The test EX and the new mid-range Forte S sedan include a standard rearview camera. Unfortunately, the base Forte LX automatic sedan does not, and buyers must pay $900 for an option package that includes a rearview camera. Buttons and controls in the Forte sedan are well-marked and easy to understand, and the EX tester even had an illuminated glovebox. Windows on the rear doors open all the way, the rear-seat floor is nearly flat and everyone gets a head restraint.